Alfred Hitchcock’s 1957 film The Wrong Man marks such a departure in tone, storyline, and the typical “Hitch” tropes that, upon first seeing it, many viewers may question whether they are actually watching a Hitchcock movie at all. The movie is a somewhat strange entry in Hitchcock’s repertoire. Based on a true story, it’s less of a film than a documentary-type recreation of a case of mistaken identity so extreme that an innocent man was put on trial for armed robbery. Henry Fonda stars as Manny Balestrero, a musician at New York’s famed Stork Club. One night, he is approached by detectives who believe him to be the same man who robbed several stores in the area over the preceding months. On specious identifications from witnesses, he is accused and booked for the crimes. As his trial commences, and his attorney (Anthony Quayle) attempts to prove that this is nothing more than a case of mistaken identity, Manny’s wife, Rose (Vera Miles), begins to sink into a serious depression and is committed to a sanitarium. The two leads are wonderfully cast in these roles. Fonda plays the hapless victim of the judicial system quite well; he portrays downtrodden defeat like no one in the business. His Manny flounders in the wake of the surprising accusations, and you feel the frustration and the impending doom that hangs about his character. And Miles, whom Hitchcock was at one point grooming to replace Grace Kelly as his go-to “ice-cool blonde” (he had designs of casting her as Madeleine in Vertigo … before she got pregnant, that is), is remarkably restrained as Rose, taking a character whose very nature could be skewed into manic histrionics and turning her into a believably distraught, broken woman. Hitchcock filmed one of his trademark cameos, but ultimately chose not to include it in the film; instead, he introduces the film to the audience by explaining that the story they are about to witness is based on actual events, much as he does in the movie’s trailer. Though the movie does not really gel with Hitchcock’s typical fare, it is nonetheless an intriguing entry in his filmography. True, it is not as well-known as some of his other productions, but The Wrong Man is nonetheless one of Hitch’s most chilling films, if only because the central mystery is so close to reality. In a sense, this movie is scarier than one such as Psycho for that very reason–because such a perverted twist of fate can happen to any one of us, just from being in the wrong place at the wrong time. 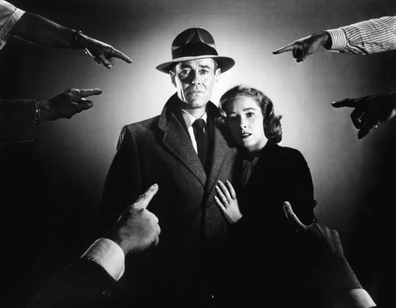 The Wrong Man is on TCM’s schedule for October 14th (4PM EST) and November 7th (2PM EST). It is also available on DVD (Amazon and Movies Unlimited are selling it for the same price at the moment, plus it is available as part of TCM’s Greatest Classic Films Collection: Hitchcock Thrillers, which is available for a great price right now at Amazon). This post is part of an ongoing countdown of Hitchcock’s twenty greatest films. The Wrong Man comes in at number sixteen on that list. For other entries, see here and here. ← A moment of childish pleasure for your day.